Lancet study says UP, Maharashtra, Delhi and Bihar are the worst affected, adds that air pollution has reduced life expectancy in the country by 1.7 years. New Delhi: One out of every eight deaths in India is attributable to air pollution, says a study released in the latest issue of the global health journal, The Lancet Planet Health 2018. The study has been jointly conducted by the Indian Council of Medical Research (ICMR), the Public Health Foundation of India (PHFI), the Washington-based Institute for Health Metrics and Evaluation and the Department of Health Research, Ministry of Health and Family Welfare. According to the study, of the roughly 1 crore deaths in 2017, 12.4 lakh deaths were attributable to air pollution. Over half of the 12.4 lakh deaths were in those younger than 70 years. It added that the average life expectancy in India would have been 1.7 years higher if the air pollution level were less than the permissible levels. “One out of every eight deaths in India could be due to air pollution. 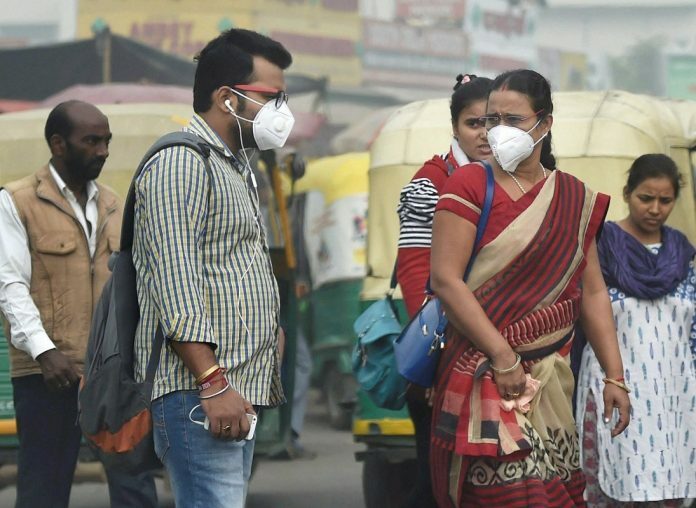 Air pollution is responsible for morbidity with respect to diseases such as COPD (chronic obstructive pulmonary disease), diabetes, heart attacks, lung cancers and strokes,” director of ICMR, Dr Balram Bhargava, said while releasing the findings Thursday. The study further said that of the deaths linked to air pollution, 6.7 lakh were from outdoor particulate air pollution and 4.8 lakh due to household air pollution. It attributed the other 1 lakh deaths to factors such as the ambient ozone pollution. Uttar Pradesh, Maharashtra, Bihar and Delhi are the top four states in terms of being exposed to higher levels of air pollution of greater than or equal to 100 PM 2.5. In 2017, UP recorded the most deaths attributable to air pollution, with 2,60,028 lives lost. It was followed by Maharashtra (1,08,038) and Bihar (96,967). They are followed by Rajasthan, Jharkhand and West Bengal. The study divided the states into three groups — low socio-demographic index (SDI), middle SDI and high SDI. The overall burden of exposure and disease is higher in low SDI states, which are Bihar, Madhya Pradesh, Jharkhand, Uttar Pradesh, Rajasthan, Chhattisgarh, Odisha and Assam. “In low SDI, the outdoor air pollution is higher and the proportion of indoor air pollution is more. Outdoor air pollution is higher in north Indian states including Delhi, Haryana and Punjab,” senior author of the study, Prof. Lalit Dandona. The study did not underline the factors leading to air pollution but experts said multiple factors, including coal burning, combustion, industrial construction, road dust, agricultural burning and waste burning contributed to pollution levels.